Are Watering Rules of Thumb Accurate? Drip Irrigation System or Sprinkler System? Homeowners often pride themselves on the curb appeal of their house. Whether it’s the garden they just planted, the perfection of their lawn, or the beautiful pond they just built, there are few things that are more satisfying to a homeowner than the ability to say that the exterior of their house is just as beautiful as the interior. Despite being engrossed by the appearance of their home, homeowners often overlook one thing: their home is hardly visible once the sun sets. If you’re spending a few hours every day maintaining the aesthetics of your home, that effort should be on display during the night time too. What Are Some Common Types Of Outdoor Lighting Systems? There are currently two major types of lighting systems: solar lighting and low-voltage lighting. Solar lighting does not require electricity. Instead, the batteries are charged through the absorption of the sun’s rays. Because of this, the impact on your electricity bill is minimal which makes this the least expensive option. That isn’t without its drawbacks though. Since solar lighting is reliant on sunlight, it cannot be installed in shaded areas and will not be able to fully charge on cloudy days. Solar lights also tend to dim as their energy is depleted, which means your house may not stay lit throughout the night. Low-voltage lighting requires a connection to your home’s energy source. Because of this, it will increase your home’s energy consumption. How drastically your energy bill will be affected depends on the types of bulbs chosen and the number of fixtures you install. Low-voltage lighting gives the homeowner more control over their display as they can set them on a timer and opt for bulbs with varying brightness intensities and colors. What Are Some Popular Styles Of Outdoor Lighting? Uplights – aimed upwards toward the object that you want to brighten up. These are most commonly used for signs. Downlights – aimed downwards at the object that you want to light up, often mimicking sunlight and moonlight. These are typically used to give off a “spotlighting” effect. Path lights – used to illuminate walkways near your home. And backlights – used to create silhouettes on objects surrounding your home. These are most often used on unique plants and statues. Backlights tend to be set up behind the object that you want to light up, which causes a shadow to appear on the front of the object. 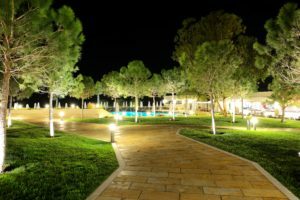 What Are The Benefits Of Having Outdoor Lighting? Safety – At nighttime, paths can be harder to see. By illuminating the pathways and “danger” areas of your landscape, you can prevent injuries from occurring. Decor – Not only does outdoor brighten up your property, it can also act as its own form of decoration. Through outdoor lighting, you can highlight water features and distinctive plants, attracting attention to the areas that you think look best. Property Value – Outdoor lighting increases the curb appeal of your home. By installing outdoor lighting, the value of your home can increase by as much as 20%! In 2016, the National Association of Home Builders found that over 90% of home buyers listed exterior lighting as essential/desirable. Pearson Sprinkler specializes in landscape and outdoor lighting design and installation. No matter what array of scenery you may have around your home, we are here to help you make your house and garden to look majestic. Contact us today! Attempting to fix your drainage system is the last thing you want to be doing in the middle of a downpour. A single puddle that refuses to drain can cause permanent damage to your landscape or garden. In order to prevent this, you need to properly maintain your garden drainage system. Maintaining your drainage system in addition to your garden may seem daunting, so here are some drainage system maintenance tips to make the process a little bit easier. If puddles are starting to form in spots where they didn’t occur previously, your drains may need to be cleaned. After a period of time without maintenance, it’s common for drainage systems to get clogged up with leaves, grass, and other debris. If clogged drains are the reason for the puddles in your garden, here are some things you should do. First, make sure you wear safety equipment. Removing the debris from your drains could result in some scrapes, so wearing gloves is advises. Safety glasses may be useful too. Clean up all debris covering your drains – Any item that blocks the drainage holes in your grates will decrease the effectiveness of your drains. Remove anything that doesn’t belong there, the most common of which will be grass, rocks, and leaves. 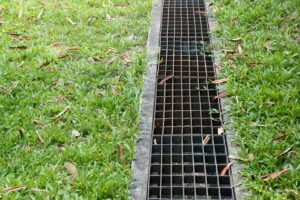 Open your grates and remove the debris that fell through – The debris that was small enough to fall through your drainage holes is still big enough to stop a drain from working. Remove the grate and clean out as much as possible. A drain snake or an auger can be especially useful in breaking up any clogs that formed deep in the pipes. Pour water down to see if the clog was removed – Use a hose and try to back up the pipes. If the water drains correctly, congratulations! You unclogged your pipes! Drainage clogs are the most common problem among garden drainage systems, but there are some things you can do to help prevent them. Downspout screens help prevent debris from passing through your drainage holes into your pipes, which prevents clogging. Downspout screens can help dramatically decrease the time it takes for drainage system maintenance by preventing the pipe from clogging in the first place. Rigid items, although they may seem useful for unclogging pipes, can cause more harm than good by damaging the pipes. It’s much easier to properly unclog a drain than it is to install a new drainage pipe due to an old one being broken. 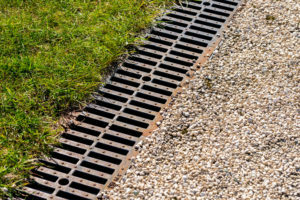 Follow these useful tips yo protect your landscape and garden drainage systems and reduce the need for maintenance. Pearson Sprinkler Co. specializes in drainage system installation and maintenance. If you are having issues with your drainage system, contact us today and schedule an appointment to have a specialist take care of it! One of the easiest and most cost-effective ways to maintain a healthy garden or lawn is with a water irrigation system. A water irrigation system eliminates the burden of hand-watering and gives property owners environmental, financial, and aesthetic benefits. Two popular residential irrigation systems are drip irrigation and sprinkler irrigation. Both methods offer unique benefits when it comes to delivering just the right amount of water to plants and lawns. Here are some of the advantages of drip irrigation and sprinkler irrigation systems. Drip irrigation is a type of micro-irrigation, meaning it is an irrigation method with lower pressure and flow than a traditional sprinkler system. Drip irrigation delivers a localized, low-volume flow of water directly to the intended target through a network of emitters, pipes, tubes, and valves. The target may include the base of a plant, the soil surface, or the root zone. Drip irrigation is often used in agriculture, horticulture, and landscaping. What Are The Advantages Of Drip Irrigation? Decreases the prevalence of weeds. Allows foliage to remain dry, reducing the risk of disease. Sprinkler irrigation is a method of distributing water similar to natural rainfall. Water moves through a system of pipes and is then sprayed into the air through pressure-regulated sprinkler heads. The sprinkler heads break the water up into smaller water drops that fall to the ground. What Are The Advantages Of Sprinkler Systems? Provides larger volumes of water to supplement minimal natural rainfall. Can be automated and programmed to operate at certain times of the day. Spray patterns can be customized. 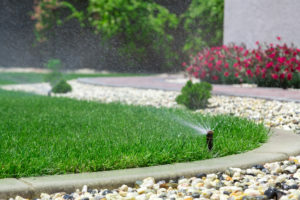 At Pearson Sprinkler Co. we specialize in both drip and sprinkler irrigation systems. So whatever your needs are, we’ll have a solution for you. Contact us today! Did you know that different drainage systems actually work for different and specific situations? There are a number of factors that determine which kind of drainage system to use for a particular section of lawn or landscaping, including the ground topography and geomorphology. In this post, we shall be looking at the different types of drainage systems and what they are suitable for. The French drain is simply a trench (about 4 feet deep) filled with a permeable material like gravel, in which water seeps into a perforated pipe and is diverted away from the property. It is typically used for residential applications to prevent surface water from penetrating and damaging the building foundations. This type of drainage consists of ditches and flexible PVC pipes. They collect water from the ground level and divert them away, and are usually suitable for areas with enough natural grade to allow water to drain away through gravity. If the gravitational pull is not enough, you may require installing a sump and pump systems. A channel drain is used for surface water and is largely popular due to its simplicity in design and installation. It consists of a channel and a removable grate, it may also require a sump, end caps and other accessories. It helps to deal with heavy run-offs caused by heavy downpours and flooding. Channel drains are more discrete and appealing aesthetically. Sump pumps are perfect for basement waterproofing systems, especially where the yard’s grading slopes towards the house area. They consist of a built-in float switch that pumps away water and prevents it from collecting directly around the foundation and leaking into your basement. Staying clear of drainage problems requires the right type of drainage system, and not every solution will work for all areas considering the various factors that should be taken into consideration. Contact Pearson Sprinkler today. We’ll help you determine which drainage system will work best for you. We are professional contractors specializing in landscape drainage systems in Plano, Texas. Water conservation is mandatory in many areas around the United States, and in Texas is no different. We have water regulations that you need to stay aware of before installing your sprinkler system. Some cities require that you comply with basic efficiency standards to limit the amount of water wasted. You can check our website to see the regulations in your city or speak with your sprinkler contractor to ensure your compliance to avoid consequences that could result in costly fines and increased water bills. Do You Want an Automated Sprinkler System? With many sprinkler irrigation systems being available, you may want to decide whether or not you want one with automated features. Newer, advanced models come with timers and moisture sensors that detect when your lawn or parts of your lawn need to be watered. If you don’t always remember to water your yard and want to make sure it gets done, having an automated system may be a good option. Not every part of your yard needs to be watered as much as others. The areas of your yard that get a lot of sunlight will require more water while those that are in shaded locations will need less. Also, areas that are located down the slope will collect and retain more water than higher ground. All these factors should be put in consideration to avoid overwatering or under watering. Lastly, you’ll want to gather information of the name and model numbers of the parts used in the sprinkler system to ensure you know what to purchase in case you need a replacement. 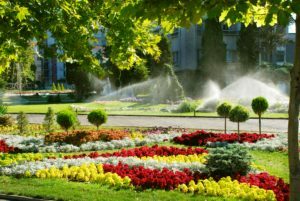 With the right watering system for your yard, you can enjoy a healthy lawn and garden every year. Pearson Sprinkler Co. can help transform your yard with the sprinkler system that works best for you. Contact us today! Please install the Wordpress Popular Posts plugin.